Sigtuna is well known as one of the earliest actual cities in the area and was formally founded around 980 AD. More unknown is the fact that the picturesque town, which today is home to around 10 000 people, was a distinctly cosmopolitan place back then. 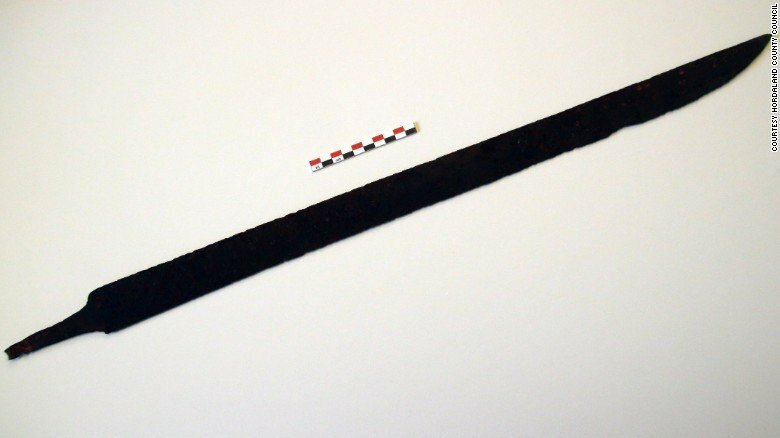 A hiker travelling the ancient route between western and eastern Norway found a 1,200-year-old Viking sword after sitting down to rest after a short fishing trip. Further studies of the area will take place next spring. The sword, found at Haukeli in central southern Norway will be sent for conservation at the The University Museum of Bergen. Jostein Aksdal, an archaeologist with Hordaland County said the sword was in such good condition that if it was given a new grip and a polish, it could be used today. “The sword was found in very good condition. It is very special to get into a sword that is merely lacking its grip,” he said. 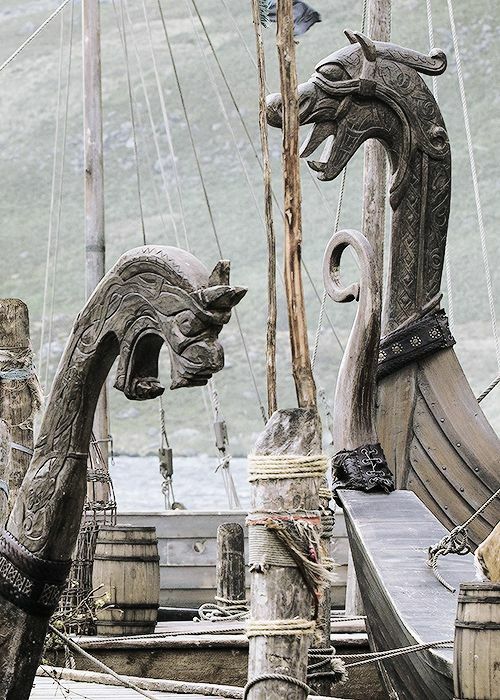 Dragon heads in the prows of Viking longships. The story of the Vikings begins in the year 793 AD, after Norwegian Vikings landed in England on the first official Viking raid. To this day, these fierce raids are the most famous of Viking stories. Now, a new study suggests a more peaceful start to Viking seafaring — and it all began in Denmark. “This is the first time we have proof that seafaring culture, which was the basis for the Viking era, has a history in Ribe. It’s fascinating,” says Professor Søren Sindbæk, one of the authors of the new study, which has just been published in the European Journal of Archaeology. 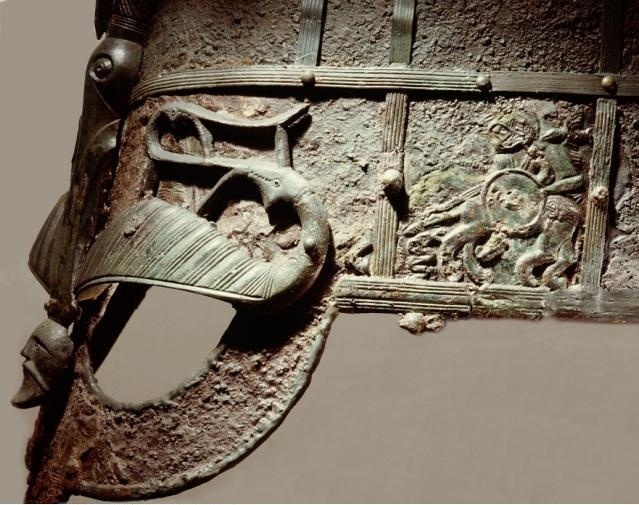 Side view detail of the helmet found at Vendel , grave I, 7th century. 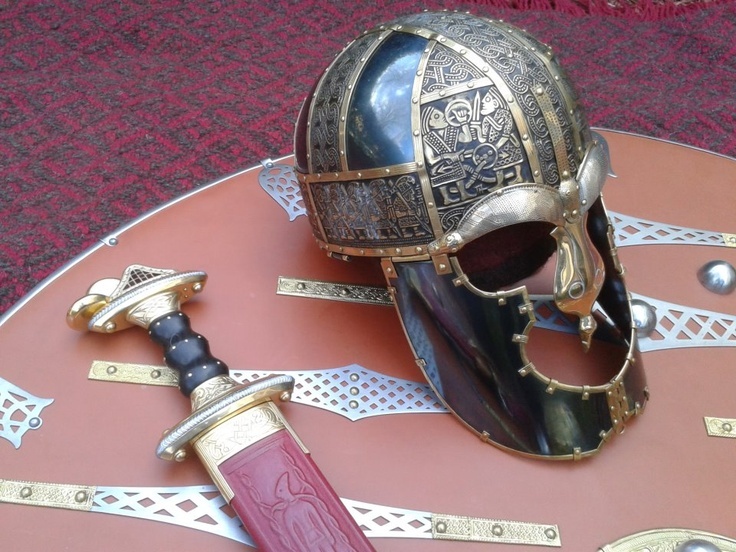 A reproduction of the Vendel helmet of the burial XIV (see below) and a Vendel sword and shield by the historical association Wulfheodenas (I suppose). The numerous tribes of the Vendel age gradually began to join in larger tribal unions or confederations, usually by force, while most Jutes, Angles and Northern Saxons of modern Denmark and Schleswig-Holstein had already migrated to Britain at the beginning of this period (starting at the early 5th century AD, of the pre-Vendel era). The Svear and the peoples of Scandinavia possibly related to the continental Goths – that is to say the Heruli (Heruls) and the Gotar (Gott Gutar and/or Geats) and their branches of modern Gotaland and the Oland & Gotland Islands (in modern southern Sweden) – went on living side by side during the Vendel period (550-793 AD) and the Viking age (793– early 11th century AD). Finally after several confrontations, around the 12th century they joined in a single kingdom, after all not being significantly different in language, origins and culture. Thereby they were both assimilated in the Swedish nation. In the Viking age, the Danes seem to have absorbed the Fervir, the Bergio, the Jutes and the part of the Heruli tribe that used to live in part of the Sjaelland Isle. It also seems that the total tribe of the Angles had already migrated to Britain, leaving their almost vacant homeland to the Dane newcomers. 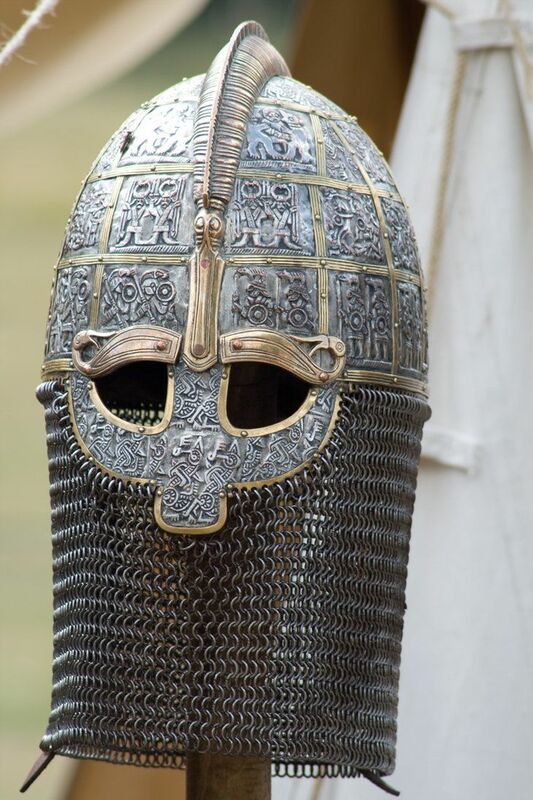 Concerning again the Vendel-type helmets, sometimes they are referred as ‘Viking helmets’. In fact, they were mostly helmets of the early Leidang armies, i.e. Nordic armies that were operating inside the Scandinavian homeland. 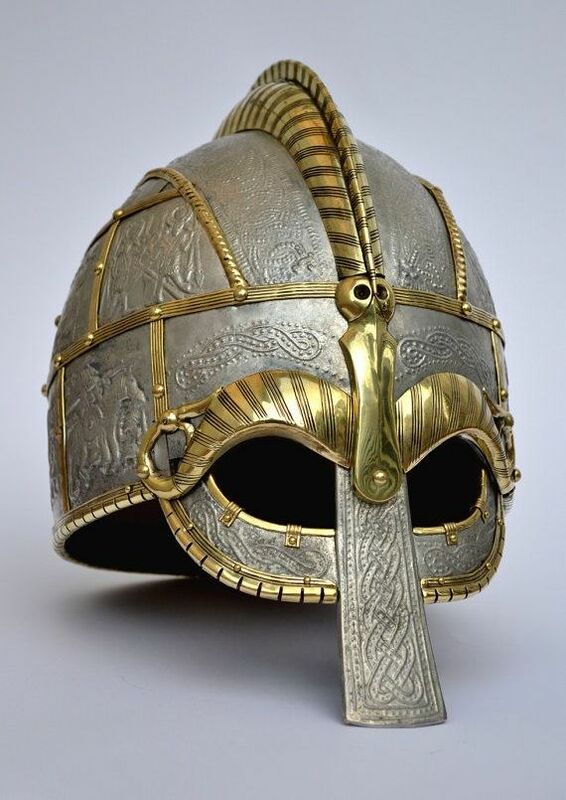 But several post-Vendel types and some Vendel proper helmets survived up to the Viking age (some of them perhaps as family heritage or heirloom) being used by Viking combatants, i.e. warriors of raiding groups or armies that were operating overseas, mostly away from Scandinavia. On the other hand, the Vendel types did spread out of Scandinavia, mainly in Britain and the South Frisian lands (the coasts of modern NW Germany and the Netherlands) by the Anglo-Saxon invaders and through military and commercial interaction with the southern Frisians who were sharing many common cultural elements with the Nordic peoples (some historians – including the author of this article – consider them as almost Nordics). In the 20th century some researchers used to believe that there is a connection of the place name ‘Vendel’ with the Vandals, the East Germanic tribe who finally conquered Roman Africa and sacked Rome itself, but nowadays this theory doesn’t seem to have many followers. Reconstruction of a helmet from the Valsgärde burials (RoyalOakArmoury.com). According to the literary sources and the chronicles (Jordanes, Beowulf epic and others) in that period the largest tribes of eastern and southern Scandinavia (i.e. modern Sweden and Denmark) were the Svears (Suiri, Suehans, the Swedes), the Gotar (Geats, Gott) and their probable branches – the Gauthigoth, Ostrogothae, Vagoth, Gutar, Theustes – the Jutes (maybe a tribal offshoot of the Gotar/Geats), the Heruli (the major part of the tribe played an important role in the Age of Migrations in the continent), the Screrefennae (the Finns, the sole non-Germanic people in the region), the Bergio, the Fervir, the Wulfingas, the Hallin, the Danes, the North Frisians, and in modern western Schleswig-Holstein the metropolitan Saxons (the core tribe of the Saxon confederacy). Western Scandinavia (modern Norway) was inhabited by even smaller tribes and clans, such as the Ragnaricii, Raumaricii, Otingis, Rugii (possibly the core tribe of the continental Rugii who settled in Pannonia and Italy), Adogit, Arothi and others. The Vendel graves are rich, and very similar to the ones excavated in Britain, namely at Sutton Hoo in the principality of East Anglia. After all, taking into account literary, linguistic and other evidence, it is possible that the dynasty of East Anglia was of Geat/Gotar origins (possibly a branch of the Wulfings). In my point of view, there is also a strong connection of the names of the Angles (forebears of the national name of the English) and the Ynglings (Ynglingas, Scylfings). After all, they seem to have been both bearers of the Vendel cultural elements. Taking into account that the Angles were a small tribe (less numerous than the Saxons and the Jutes: possibly a few clans) I would hypothesize that they were a tribal offshoot or close relatives of the Ynglings. It is possible that the Angles originating from modern Sweden were at first established in southern Jutland and modern Schleswig-Holstein and then invaded Britain becoming royal dynasties in East Anglia, Bernicia, Deira, Mercia and possibly elsewhere. 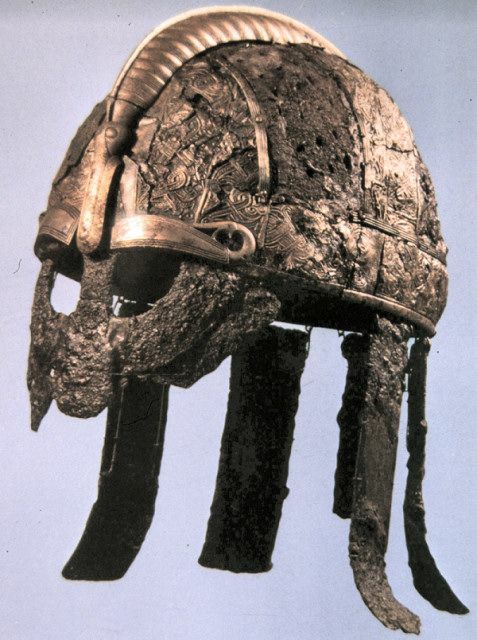 Helmet from Vendel Cemetery, burial XIV. Observe the nose-protector in the shape of the beak of a raven (a very important bird in the Scandinavian cosmology). 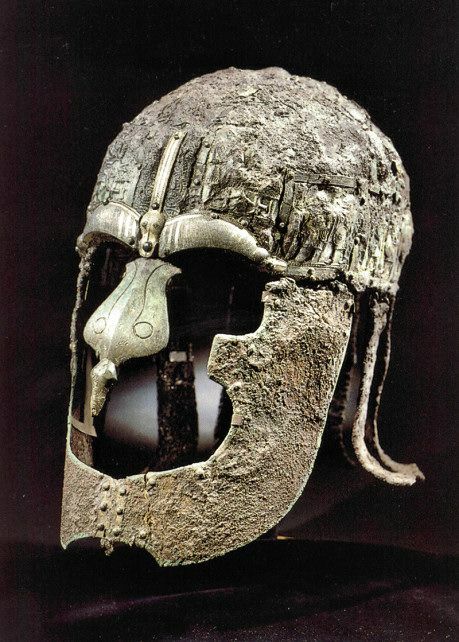 Vendel helmet reconstruction by Ivor Lawton (copyright). The Vendel period of the history of Sweden and essentially of the whole area of eastern and southern Scandinavia (of course including modern Denmark) is the era before the Viking Age (793 – early 11th century AD). It lasted from the mid-6th century AD to the end of the 8th century and is characterized by princely burials of warlords and powerful warriors with impressive weapons. This historical period and the homonym cultural conglomerate (Vendel culture) took their name from the site Vendel at the historical district Uppland in eastern Sweden, north of Old Uppsala, the ancient centre of the Svear kings. The most characteristic cemeteries were found there. It seems that Uppland (where later the important cities of the Viking age Uppsala and Sigtuna were developed) was very important politically during the Vendel period. The area was rather the political center of the tribe of the Svears (Latin Suiri and Suirones and according to Jordanes: Suehans, Nordic: Svear, Anglo-Saxon: Sweonas, modern Swedes) who had extended to it earlier coming from Svealand, their core territory in the south. Uppland means the upper land, the land in the north. Another very important archaeological site of the Vendel period is Valsgärde, a place about three kilometres north of Old Uppsala. The tombs excavated at Valsgärde gave findings of the same type as those of the Vendel archaeological site. Ulltuna is another important site of this period. 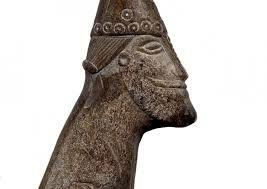 The influence of the Vendel culture does not seem to have been strong in western Scandinavia, i.e. modern Norway (Iceland and the Faeroe Isles were not yet inhabited by Scandinavians).